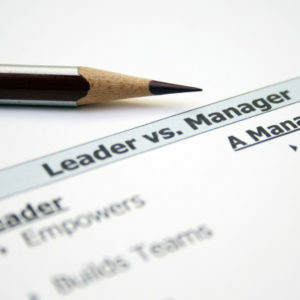 Anyone can become a manager, merely by awarding the title. Anyone can be given the responsibility for the oversight of a team, or a company function. That makes them a manager — but that is simply a name. A leader, on the other hand, must be earned and recognized by one’s peers. A leader inspires, encourages, builds up their team—and everyone else around them—and makes them better, simply by association. One of the factors that set a leader apart from a manager is that a leader guides by example. Often, managers simply enforce rules and follow procedures as part of their job function. They manage the checklist of tasks that need to be completed. They may even feel, because of their position, they aren’t even subject to the same rules. A leader, on the other hand, lives by the set of rules he expects others to follow, never stating, even by action, “Do as I say, not as I do”. Leaders behave the way they expect others to behave and demonstrate by their behaviour what their expectations are for the team. A leader is a person of honesty and integrity. She doesn’t choose sides based on popularity or politics. She is objective in all situations. A true leader isn’t afraid to offer, or to seek, creative solutions to problems. And she’s willing to make honest, unbiased decisions — even when those decisions are unpopular. A leader bases decisions on the big picture, the good of the whole, as opposed to offering a quick fix, or one that may appease some people for awhile, but that may cause more damage in the end. A leader inspires, encourages, builds up their team & everyone else around them & makes them better. A true leader doesn’t operate on the pretense “Because I said so”. A leader may be firm and unmoving in his treatment of others, but if so, he is firm and consistent in his treatment of everyone, not simply those he likes or dislikes. Leaders refrain from showing favouritism, which isn’t always an easy task. But fairness is an innate quality in a leader’s personality, causing him to treat every situation and every person he comes in contact with, equally, based solely on individual circumstances. Good leaders look for opportunities to recognize and praise a job well done and do not feel threatened by another’s success. True leaders recognize that success of the team is success of all. Leaders spread the credit and you’ll often hear them say “we”, and seldom “I”. Such behaviour inspires loyalty, trust and respect among employees, colleagues, friends and family. A leader is an inspiration to everyone around them — never just a “boss”. While leaders are fair, act with integrity, and recognize the success of others, they are also bold enough to call a “spade a spade”, and never sugar-coat a error or a bad situation. Even bad news can be conveyed with calm and respect, and a true leader knows that. A leader is capable of offering constructive direction in a manner that inspires others to improve. And he’s able to offer discipline in a respectful way that lets a person know what they did may have been wrong, but that doesn’t mean they are.